Our product range includes a wide range of autofy anti-theft alarm for all bikes, autofy mercedes bluetooth music adapter and autofy side stand for all bikes. 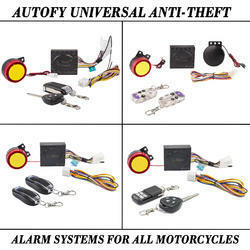 Autofy Thief Guard is the best Two Wheeler Anti theft alarm system which can safeguard your Bikes & Scooters. It is made compatible with all Bikes and Scooters (Geared / Non - Geared & All Models). The advanced touch mechanism senses every touch and generates alarm thereby protecting your two wheeler. The product also comes with smart Ignition and bike locator feature. It is better than normal disc lock, gear lock or handle lock or any such lock which serves just one purpose. This motorcycle theft alarm is made from premium quality material and comes with a flip key (like cars) and a long key (normal bike key). The long / raw key can be used to make duplicate key for your vehicle. Both the keys have self-start, lock-unlock and locate buttons on them to reduce your manual effort and add style to your two wheeler. The smart bike locator feature helps you to find your bike from a distance of 100 meters in parking lots, malls etc. This is undoubtedly the best Motorcycle lock alarm product. If you have a Mercedes produced from the year 2009 to 2014, you would have faced difficulties in staying up to date with the latest in music owing to the absence of Bluetooth connectivity in these mercs for music streaming. You no longer have to worry about that with the arrival of this latest ground-breaking accessory. 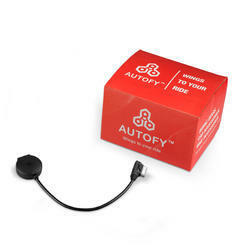 Autofy Bluetooth music adapter for all models of Mercedes Benz year 2009 - 2014 is the best music accessory that lets you stream your music from your phone into your car's music system. All that you have to do is to plug the device into the mmi port and switch the audio input to aux mode with your phone connected to the Autofy bt music adapter. The compact design of the adapter lets its easily fit inside the glove compartment without taking up any space. The software has been optimized for easy connection and music streaming with your Mercedes. Similar care has been taken to maintain ease of use through all phones. A built-in premium csr chipset complements the software to keep any kind of issues like degradation in quality and lag in broadcast or other issues regarding music streaming at the ward. The device connects and saves two devices simultaneously. It comes with an auto-pairing feature for the saved devices so you do not have to pair your device every time you travel in your car. A USB port too has been provided to let you play music from your USB flash drive. Switching between two modes i.e. Bluetooth and USB can also be done easily, thanks to a dedicated button on the device. So now making your car sing along won't be as easy as it was earlier. 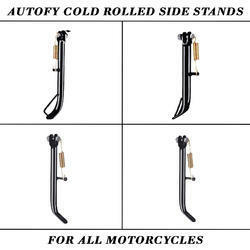 Autofy Side Stands for all motorcycles is a must have bike part that is available at reasonable prices. The quality has not been compromised in the pursuit of budget pricing. The Iron (CRC) used in the manufacturing of the footrest assembly is developed using Cold Rolling process that involves rolling of iron below recrystallization temperature to improve the finishing of the surface along with 20% increase in the strength of the metal. The metal has been painted with anti-rust paint to fortify the assembly against deterioration caused by dust and moisture. Special care is taken while designing these after-market parts that they are of similar dimensions and fitments to ensure easy replacement by the buyer himself without any assistant from a professional mechanic. Please feel free to visit youtube.com/Autofy for more products videos by Autofy. Autofy also manufactures Side stands for Honda Dream Yuga, TVS Apache RTR, Hero Honda CD Deluxe , TVS XL Super, Bajaj CT 100, Bajaj Platina , TVS Victor , Kawasaki Bajaj 4S, Bajaj Caliber , Bajaj Pulsar DTSi Old Model, Bajaj Discover , Hero Honda CD 100 , Honda Shine and Hero Passion X Pro and many more.